Alopecia is the medical term for hair loss, which can occur in small, isolated areas or over a person’s entire body. It can be temporary or permanent, and tends to occur more often in men than women. Normal hair loss is a natural consequence of hair growth. Each hair grows for several years and then goes into a resting phase that lasts for several months. After this resting phase, the hair falls out and a new hair starts to grow. We normally lose about 100 hairs a day, although more hair may be lost from excessive brushing, washing or rubbing. Alopecia has many causes, including an inherited disorder, skin burns, traction (e.g., from hairstyles that pull the hair tightly or compulsive hair pulling), radiation therapy and infections. Some alopecia due to traction may be prevented by loosening hair from tight ponytails or braids. In some situations, temporary hair loss may occur for other reasons. For example, many people experience more hair loss than normal after major surgery or a severe illness with a high fever. Certain medications, including many cancer treatments, may also cause hair to fall out. Hormonal imbalances, an over- or under-active thyroid, and certain fungal infections can also be the cause. However, when these situations are corrected, the hair usually returns. In contrast, most cases of alopecia are caused by an underlying disease or genetic predisposition and cannot be prevented. There are many different types of alopecia, but the two most common are adrogenetic alopecia and alopecia areata. Male-pattern baldness affects approximately 30 percent of Caucasian men aged 30 years. The incidence increases to 50 per cent by age 50 and 80 per cent by age 70. Hair loss can begin at any age, even in the middle teen years. Caucasian men are more likely to be affected than Asian, North American aboriginal and African men. Female-patterned baldness affects approximately 13 percent of pre-menopausal women. The incidence increases to 50-75 per cent in women age 65 and older. Approximately 2 per cent of the population will develop alopecia areata at some point in their lives. Approximately 1-5 per cent of alopecia areata patients will progress to alopecia totalis or alopecia universalis (the loss of all body hair). 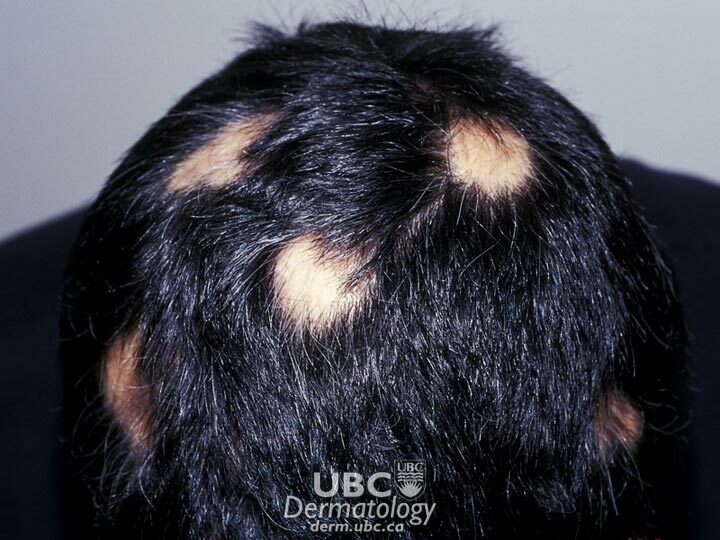 Alopecia areata occurs in males and females of all ages and races. It develops most frequently in people who are 15 to 29 years old and who have relatives with the condition. The condition can develop at any time but most often begins in childhood or adolescence. 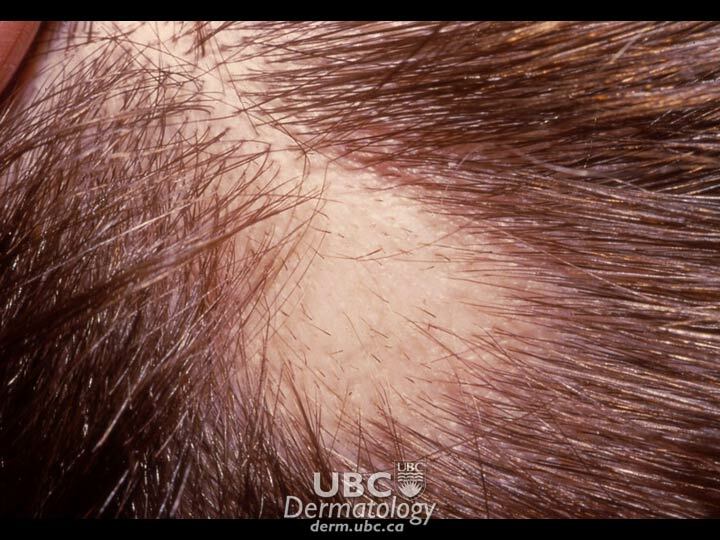 Androgenetic alopecia (pattern baldness): Androgenetic alopecia can occur in both men and women. In men, androgenetic alopecia is caused by hormonal changes in genetically predisposed individuals. Natural processes in the body convert testosterone, a hormone present in high levels after puberty, to dihydrotestosterone (DHT). DHT acts on hair follicles to slow down or stop hair production, resulting in thinning hair. In women, androgenetic alopecia is also caused by a combination of heredity and hormone levels. However, the mechanism is not currently well understood by scientists. Some research suggests that while even trace levels of testosterone-derived DHT may trigger hair loss in women, other mechanisms may play a role. 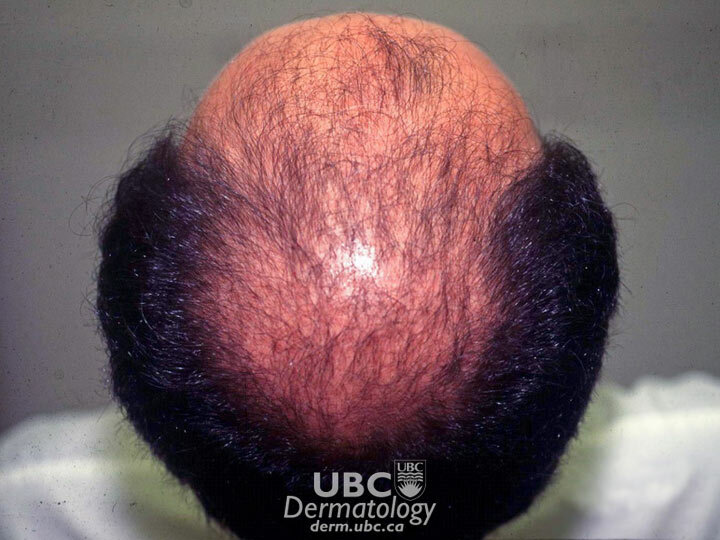 Men develop androgenetic alopecia when testosterone is converted to dihydrotestosterone (DHT). However, only men with a genetic predisposition for baldness are affected by this hormonal change. Current research suggests that baldness is influenced by mutations on the X chromosome (possessed by both sexes) rather than the Y chromosome (possessed by men only), making a maternal history of pattern baldness a stronger determinant of this condition. Alopecia areata: Alopecia areata is an autoimmune disease that causes groups of hair follicles to be mistakenly attacked by a person’s own immune system. In affected areas, the hairs stop growing and the follicles become very small. Hair production drastically slows, and hair may not appear above the skin’s surface for months or even years. While new research has identified the genes that are linked to this condition, the exact triggers that cause a person’s immune system to attack groups of hair follicles are not known. Research suggests that the triggers may be environmental, stress-related, or viral. The condition is also sometimes associated with other diseases, such as autoimmune thyroid disorders, discoid lupus and secondary syphillis. Even when exposed to the same triggers, one person may not develop alopecia areata because they do not have the same genetic make-up as another person. New research is starting to show that some people have genetic markers that make them more likely to develop the condition and that determine its severity.